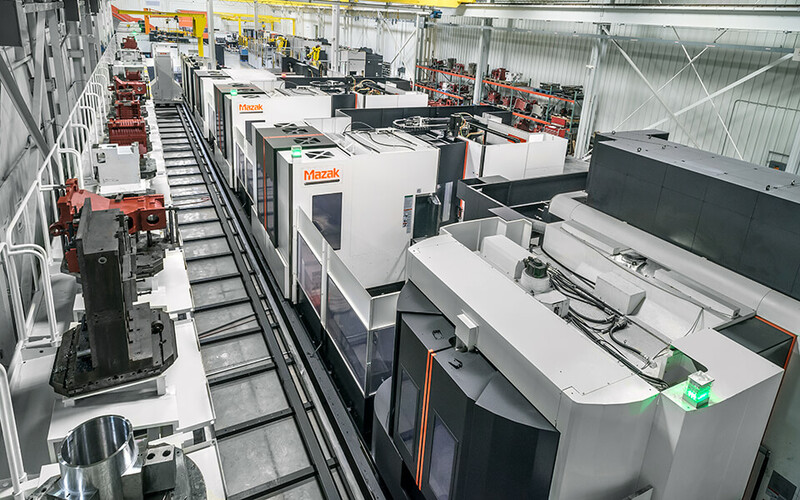 Mazak has been successfully manufacturing some of the world’s most advanced Multi-Tasking, 5-axis, turning and milling machines since 1974 in its Florence, Kentucky manufacturing facility. That facility was reimagined to incorporate the company’s forward-thinking Mazak iSMART Factory™ concept. This concept encompasses the complete digital integration of the factory with state-of-the-art manufacturing equipment, automation and advanced manufacturing practices. It hinges on the free flow and sharing of data in terms of process control and operation monitoring. In the factory, the MTConnect® open communications protocol works with process support software and provides connectivity and the capability to monitor then harvest data from all the different production floor machines, cells, devices and processes. Yamazaki Mazak headquarters in Aichi, Japan was the first facility to incorporate this factory concept. Our facility is the second in the world to adopt the new system. Eventually Yamazaki Mazak will designate all ten of its manufacturing operations as Mazak iSMART Factories. The Kentucky Mazak plant has undergone 16 expansions to date as we continue to prove our commitment to growth, technology and the total support of our customers across all industry segments. Critical parts of that strategy include plant-wide connectivity, automation and optimized production flow. ISO 9001:2008 certified, Mazak is the only machine tool manufacturing plant nationwide with dedicated facilities to manufacture, repair and rebuild machine spindles. Mazak believes that manufacturing in the markets we serve is the most effective way to meet the needs of our customers.